It was the early seventies and rock and roll was firing on all cylinders. In 1972, Bowie became "Ziggy", Alice had "School's Out" LED ZEPPELIN was on the loose after IV and THE WHO were hoping everyone would "Join Together" with the band. Oh yeah... and a southern California kid by the name of Doug Harr would have his ears glued to such radio stations as 95.5 KLOS, 93 KHJ and "the mighty MET," 94.7 KMET, daydreaming of the next concert coming to town. Hot on the heels of their Exile On Main Street release in May, one of rock's greatest bands were hitting the road and coming to the "fabulous" Forum in Los Angeles, California on June 11... not for one show that day, but two! One in the afternoon and one at night. That particular show by the ROLLING STONES would mark the first of a dozen major concerts making their way to the "fabulous" Forum in the seventies. "The band skipped over their early hits and played songs mostly from the 1968-1972 period, cranking out hits like "Gimme Shelter", "You Can't Always Get What You Want", "Jumpin' Jack Flash" and , writes Harr, who has authored a new book, titled Rockin' The City Of Angels - Celebrating the Great Rock Shows of the 1970s - In Concert, On Record, and On Film that features this particular concert experience and many others from the decade (including all of the aforementioned). This month marks the 41st Anniversary of the EAGLES' three-night stand at the Forum during their Hotel California tour. Shows so sonically pleasing that some of the songs recorded those nights subsequently appeared on the band's very first live album, Eagles Live, accounting for five of the fifteen featured tracks. PAUL MCCARTNEY & WINGS started off the summer in fine fashion that year with two-performances at the Forum on June 21 and 22 that marked Paul's first live performances in Los Angeles since THE BEATLES performed at Dodger Stadium ten years prior in 1966. "The Wings Over The World tour of 1975-1976 attracted massive audiences and was one of the most successful tours of that time; it is also a personal favorite," comments Doug. "The stop at the Los Angeles Forum on June 21, 1976, was just one of many dates in North America and it was a fabulous night of rock 'n' roll." The following year, LED ZEPPELIN came into town, performing an incredible six-night stand at the Forum during their Presence tour. "LED ZEPPELIN, the mightiest rock band of the 1970s, was the soundtrack to my life in Los Angeles." 396 pages. 34 chapters featuring just as many artists. More than 500 images captured by some of rock's greatest photographers. ELTON JOHN, AC/DC, YES, HEART, PINK FLOYD, ELECTRIC LIGHT ORCHESTRA, RUSH and others are "here" as well! So many great shows. So many memorable experiences. If you were able to see one of rock's greatest artists on tour in the seventies, then you know just how lucky you were to witness the spectacle. If you only dreamed about what it was like, then your rock 'n' roll day has come with the arrival of Rockin' The City Of Angels, a book that captures some of the biggest and best shows to ever land in the Southland. If you never had that opportunity, Rockin' The City Of Angels gives you those front row seats you wish you had! Call the tome -- nearly the size of an LP cover -- a wonderful perspective from both a true fan's point of view and the photographer's pit. Doug has now attended over 400 shows during his lifetime and it should come as no surprise that he still gets excited about great shows coming to town. 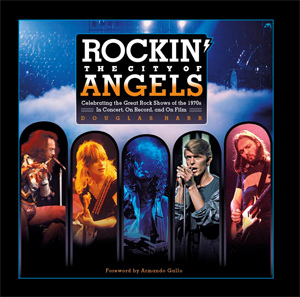 SPECIAL NOTE: Rockin' The City Of Angels makes for a terrific holiday gift for any music fan and is available at Amazon HERE. This December marks the 40th Anniversary of QUEEN's performance at the Forum during their News Of The World Tour (12/22) and the 50th Anniversary of the venue, itself (12/30). It also marks the 38th Anniversary of FLEETWOOD MAC's performance at the Forum during their Tusk Tour (12/4 - 12/6). "This book celebrates more than thirty of these incredible performances including key tours by bands such as LED ZEPPELIN, QUEEN, DAVID BOWIE, FLEETWOOD MAC, GENESIS, HEART, JETHRO TULL, PINK FLOYD, THE WHO and YES. We'll share memories of those legendary concerts and my reviews of the best video documents of the era, each band illuminated by a hand-picked collection of brilliant images -- some never-before seen -- by the best photo-journalists of that time." ACT 1 - "Rock Gods & Entertainers"
THO WHO kicks off the seventies decade with a featured performance at Anaheim Stadium on June 14, 1970 during their "Tommy" Tour. What follows in that chapter are performances and tours by THE ROLLING STONES ("Exile On Main Street" Tour: the L.A. Forum appearance was 45 years ago this month on June 11, 1972), ALICE COOPER ("Welcome To My Nightmare" Tour), JETHRO TULL ("A Passion Play" Tour), ELTON JOHN ("Captain Fantastic And The Brown Dirt Cowboy" Tour), DAVID BOWIE ("Station To Station" Tour), WINGS ("Wings Over The World" Tour), QUEEN ("News Of The World" Tour), LED ZEPPELIN ("Presence" Tour), STYX ("Pieces Of Eight" Tour) and AC/DC ("Highway To Hell" Tour). ACT 2 - "Shamans, Storytellers & Mellow Rockers"
This section highlights the performances and tours of GENESIS ("The Lamb Lies Down On Broadway" Tour), CAT STEVENS ("Numbers/Majikat" Tour), AMBROSIA ("Somewhere I've Never Traveled" Tour), YES ("Relayer" Tour), EAGLES ("Hotel California" Tour), SUPERTRAMP ("Even In The Quietest Moments" Tour), HEART ("Little Queen" Tour), KANSAS ("Point Of Know Return" Tour), FLEETWOOD MAC ("Tusk" Tour: the last featured tour of the 70's in this book - December 4-6, 1979) and PINK FLOYD (1980's "The Wall" Tour). ACT 3 - "Virtuoso's & Classical Rockers" This section features the performances and tours of FRANK ZAPPA AND MOTHERS, RICK WAKEMAN, EMERSON, LAKE & PALMER ("Brain Salad Surgery" Tour), KING CRIMSON ("Starless And Bible Black" Tour), PREMIATA FORNERIA MARCONI ("The World Became The World" Tour), GENTLE GIANT ("The Power And The Glory" Tour), CAMEL ("The Snow Goose" Tour), HAPPY THE MAN ("Crafty Hands" Tour), ELECTRIC LIGHT ORCHESTRA ("Out Of The Blue" Tour), RUSH ("Hemispheres" Tour), DIXIE DREGS ("Night Of The Living Dregs" Tour), KATE BUSH ("Lionheart" Tour) and the band, U.K. ("Night After Night" Tour). This section features additional photos and commentary on the band GENESIS along with the solo efforts of the band's individual members - Phillips, Collins, Banks and Rutherford - and a sole section about Peter Gabriel. PUBLISHER: DIEGO SPADE PRODUCTIONS, INC.